Energy-absorbing seat for ground vehicles that mitigates the effects of vertical acceleration pulses propagating from underbody mine blasts. The seat must adapt its performance across the weight range from the 5th percentile unencumbered female to the 95th percentile fully encumbered male, and across the spectrum of blast pulse peak acceleration values and durations, without any adjustment or input by the occupant. This adaptation to occupant weight and blast pulse must, as a requirement, be accomplished without input power of any kind since a mine blast will have a high likelihood of disabling any power system, rendering the powered energy absorber non-functional. 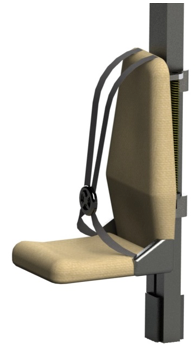 Wolf’s blast attenuating, dynamically adapting seat system automatically adapts its EA response to the weight of the occupant seated at the time of the event, and to the acceleration pulse transmitted to the seat. The stroking seat itself is relatively lightweight so that its EA response is tailored to occupant weight and not dominated by the pure heft of a heavy seat. The beam structure upon which the seat strokes is stout, to maintain its integrity through the blast and the drop down. The vertical beam is also designed to contribute rollover protection when attached at the roof, maintaining the occupant space between floor and roof at each individual seating location.